The Civilian Pilot Training Program (CPTP) was a flight training program (1938–1944) sponsored by the United States government with the stated purpose of increasing the number of civilian pilots, though having a clear impact on military preparedness. In the years immediately preceding World War II, several European countries, particularly Italy and Nazi Germany, began training thousands of young people to become pilots. Purportedly civilian in nature, these European government-sponsored programs were, in fact, nothing more than military flight training academies. In October 1938, General Henry H. "Hap" Arnold brought in the top three aviation school representatives to request they establish an unfunded startup of CPTP schools at their own risk. These were Oliver Parks of Parks Air College, C. C. Moseley of the Curtiss-Wright Technical Institute, and Theophilus Lee of the Boeing School of Aeronautics; all agreed to start work. The CAA headed by Robert Hinckley,created the Civil Aeronautics Act of 1938 that contained language authorizing and funding a trial program for what would evolve into the Civilian Pilot Training Program (CPTP). President Franklin D. Roosevelt unveiled the program on December 27, 1938, announcing at a White House press conference that he had signed off on a proposal to provide a needed boost to general aviation by providing pilot training to 20,000 college students a year. Following the precedent established by the Europeans, the CPTP was established as a civilian program but its potential for national defense was undisguised. The program started in 1939 with two laws passed by Congress in April and June, with the government paying for a 72-hour ground school course followed by 35 to 50 hours of flight instruction at facilities located near eleven colleges and universities. It was an unqualified success and provided a grand vision for its supporters—to greatly expand the nation's civilian pilot population by training thousands of college students to fly. The military establishment was initially unenthusiastic about the CPTP concept, quite unimpressed by any program initiated and administered by civilians. Congress, too, was split along mostly party lines as to the value of the CPTP. Isolationists branded the program as provocative saber-rattling that threatened the nation's neutrality; others slammed it as a pork barrel waste of tax dollars, while supporters touted the positive impacts on the aviation industry and the defense value of a vastly enlarged base of trained pilots. After the Nazi invasion of Poland on September 1, 1939, triggered World War II, the military value of the CPTP became obvious, even to the program's detractors. The United States started to evaluate its ability to fight an air war and the results were appalling. Pilots, instructors, and training aircraft were all in short supply. Acknowledging the shortage of trained pilots, both the Army Air Corps and Navy reluctantly waived certain “elimination” courses for CPTP graduates and allowed them to proceed directly into pilot training. The Army's proposal met with stiff resistance. Just two weeks after the American Aviation Daily article appeared, 83 companies with a vested interest in general aviation organized the National Aviation Training Association (NATA). NATA members recognized that, if left unchallenged, the Army plan would, for all practical purposes, ban private aircraft from U.S. skies. The NATA and other aviation interests blunted the Army's bid with an effective lobbying campaign in Congress. Their actions not only saved the CPTP, they may have saved the entire general aviation industry in the United States. The inclusion of Tuskegee University in the ranks of CPTP participants, along with Hampton University, Virginia State University, Delaware State University, and Howard University, helped open the doors for the first African-American military pilots. The onset of World War II and political pressure combined to compel the U.S. Army Air Corps — as it was known before June 20, 1941 — to employ African-Americans as officers and pilots, with the majority of its personnel being graduates of the CPTP. The decision to train civilian pilots also produced an unexpected, but welcome, side effect on the general aviation industry. As it turned out, the United States faced just as large a shortage of training aircraft as it did civilian pilots. 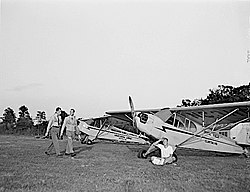 The federal Civil Aeronautics Authority (predecessor of the Federal Aviation Administration) regulations required a CPTP-participating flight school to own one aircraft for every ten students enrolled in the program. Furthermore, the requirements specified for these aircraft narrowed down the field to only several models in production at that time, with most flight schools preferring the tandem-seat configuration of the Piper Cub. Seizing the opportunity unexpectedly thrust upon them, several light aircraft manufacturers quickly filled the market void with CPTP-compatible aircraft of their own, such as the WACO UPF-7 and the Meyers OTW biplane. Aeronca and Taylorcraft also produced tandem versions of their existing side-by-side seating high-winged monoplanes, each of which would lead to their own military equivalents. After the attack on Pearl Harbor and the U.S. entrance into World War II, the CPTP changed forever, including the name. The Civilian Pilot Training Program became the War Training Service (WTS) and, from 1942 to 1944, served primarily as the screening program for potential pilot candidates. Students still attended classes at colleges and universities and flight training was still conducted by private flight schools, but all WTS graduates were required to sign a contract agreeing to enter the military following graduation. There is a list of colleges and universities participating in the CPTP in '43-'44 in the appendix of "They Flew Proud". The CPTP/WTS program was largely phased out in the summer of 1944, but not before 435,165 people, including hundreds of women and African-Americans, had been taught to fly. Notable legends trained under the CPTP include: Astronaut/Senator John Glenn, top Navy ace Alexander Vraciu, Douglas test pilot Robert Rahn, top World War II ace Major Richard Bong, triple ace Bud Anderson, former Senator George McGovern, WASP Dora Dougherty and Tuskegee airman Major Robert W. Deiz. The CPTP admirably achieved its primary mission, best expressed by the title of aviation historian Dominick Pisano's book, To Fill the Skies with Pilots. Two of the largest CPT/WTS schools were Piedmont Aviation, operated by Tom Davis, and Southern Airways, operated by Frank W. Hulse. Piedmont's school was based in Winston-Salem, North Carolina, while Southern had schools in Charlotte, North Carolina, Greenville and Camden, South Carolina, and in Birmingham and Decatur, Alabama. Both companies trained over 60,000 war pilots including young men from Brazil (Piedmont) and a large number of Royal Air Force pilots from England (Southern). By 1947 Davis had turned his school into Piedmont Airlines with scheduled passenger flights between North Carolina and Ohio. In 1949, Hulse had Southern Airways flying commercial service between Jacksonville, Florida and Memphis, Tennessee, and between Atlanta and Charlotte. Both airlines began operations with war surplus Douglas DC-3 aircraft that were modified for commercial service in their former CPT/WTS maintenance hangars. Several CPTP graduates, including Betty Tackaberry Blake, Florence Shutsy-Reynolds and Betty Jane Williams, went on to serve as a Women Airforce Service Pilot (WASP). ^ The Army Air Forces in World War II, Volume Six Men and Planes. ^ "Black Americans in Defense of Our Nation". Sam Houston State University. Archived from the original on 3 July 2009. Retrieved 11 June 2011. ^ Lu Hollander, Executive Director of the 99's. Private Communication, September 18, 1999. ^ John F. Kennedy Library, Boston, “White House Central Name File, Box 1532, Folder: KUNZ.” Letter from Opal Kunz to President Kennedy, dated April 14, 1961. ^ "Betty C.G.T. Blake". Veteran Tributes. Veteran Tributes, Gulfport, MS. Retrieved 19 September 2015. ^ Lash, Cindi (11 November 2002). "WASP Put Sting in War Effort". Pittsburgh Post-Gazette. Retrieved 2019-01-03 – via Newspapers.com. and "How the WASP Put a Sting in the War Effort". Pittsburgh Post-Gazette. 11 November 2002. p. A-6. Retrieved 2019-01-03 – via Newspapers.com. ^ "Betty Jane "BJ" Williams". Women in Aviation International. Archived from the original on 5 October 2018. Retrieved 2019-01-03. They Flew Proud by Jane Gardner Birch. On the Excerpt page of the web site http://www.theyflewproud.com you can download a complete list (by state) of the educational institutions that participated in the Civilian Pilot training Program. "Route of the Aristocrats: The History of Southern Airways": Master's Thesis - The Center for the Study of Southern Culture - University of Mississippi. 1993. David Lenton Weatherford. This page was last edited on 4 January 2019, at 01:45 (UTC).